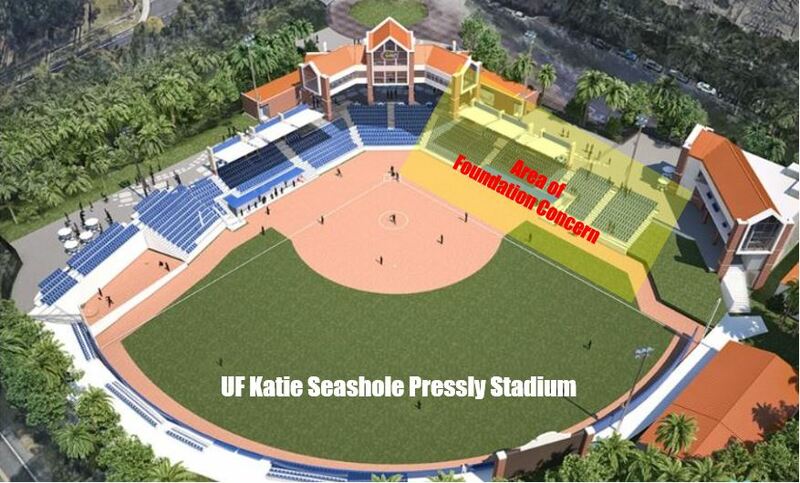 As part of the $15 Million dollar renovation of the Katie Seashole Pressly Softball Stadium renovation, additional bleachers were to be constructed adjacent to the existing seating area (see below). The installation of the new seating required the complete excavation of the soil wall adjacent to the old bleachers. 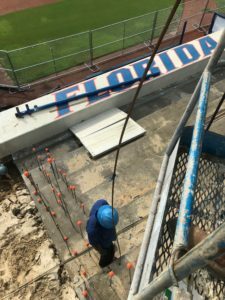 The general contractor was concerned about the loss of soil under the existing bleachers once the excavation was undertaken. Due to the time sensitive nature of this project, Foundation Technologies was contacted to provide a quick and economical solution to prevent the undermining of soils under the bleachers. The construction of a retaining curtain wall using single part permeation grout was determined to be the solution. This chemical grout binds with existing soils to create a rigid vertical wall that will hold the soils in place. By injecting almost 400 gallons of single part polyurethane along the entire edge of the existing bleachers, Foundation Technologies constructed a 20’ foot high wall that successfully held the soils in place during the construction of the new bleachers. This quick solution allowed construction to stay on schedule for this major project. General Contractor: D.E. Scorpio Construction Inc. Upon ground breaking of the $55 million St. Vincent’s Heart Pavilion, the adjacent medical office building (insert name) encountered foundation settlement along one side of the building due to the excavation. 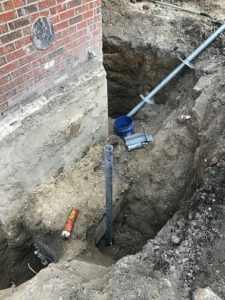 Goodson Nevin and Associates evaluated the issue and determined that foundation resistance (push) piers needed to be installed along the entire side of the building to insure against further settlement. Foundation Technologies mobilized immediately and installed resistance piers along the side of the building. 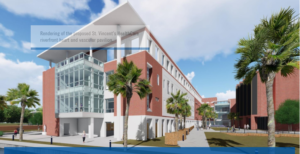 Due to the building’s close proximity to the St. Johns River, water intrusion presented a difficult challenge during the installation process. All piers were installed to depths of approximately 50 feet and the structural integrity of the building was preserved while the Heart Pavilion construction resumed. Foundation Contractor: Foundation Technologies, LLC. 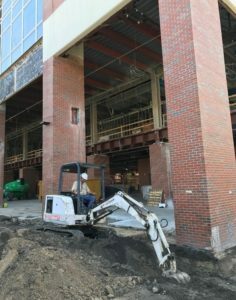 The project consisted of renovating and adding onto the Career Connections Center at the J. Wayne Reitz Union on the University of Florida main campus. The facility was outdated in its utility infrastructure and technology capabilities, and the renovation upgraded all systems utilities and provided advanced technologies for the library and video conferencing. This project included site improvements, underground utilities, total building commissioning, all new furnishings and equipment, and a fantastic graphics package further enlivening the space. During the design and engineering phase of the expansion, it was determined that the proposed additions to the building would stress the existing foundations beyond their initial load bearing design limits. A combination of helical pilings and cementitious grouting was prescribed to increase the load bearing capacity of the existing foundation. 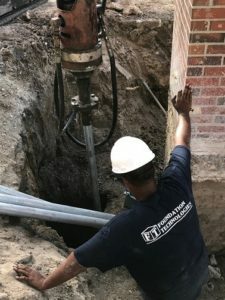 Foundation Technologies installed double helix pilings at the base of the existing foundation column pads to provide additional support. In addition, pressure grouting was performed on several the column pads due to access constraints. 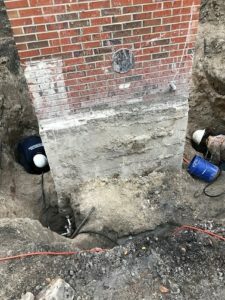 These pads were approximately fifteen below grade and required extensive excavation and piling installation from ground level down into the excavated area. Despite the unforeseen challenges, Foundation Technologies successfully completed the project within the allotted time frame and helped keep the project on schedule. 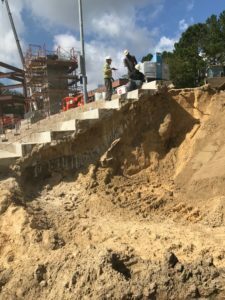 Engineer: GSE Engineering and Consulting, Inc.
Seawall Erosion Repair: What Are the Causes of Erosion?